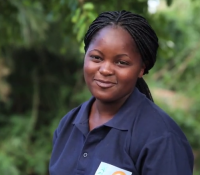 A Young Woman's Dream in Malawi - Planet Aid, Inc.
Upile is a young woman living in rural Malawi whose goal was to become a primary school teacher. Today Upile is living her dream by helping to change the educational opportunities for young girls and boys in her community. Upile is one of the many thousands to have completed Humana People to People's DNS Teacher Training Program, which is supported by Planet Aid in Angola, the Democratic Republic of Congo, Guinea Bissau, India, and Mozambique. Click here to find out more about how this program is helping bridge the teacher gap in Malawi and other developing countries, creating a new generation of skilled educators and community leaders.